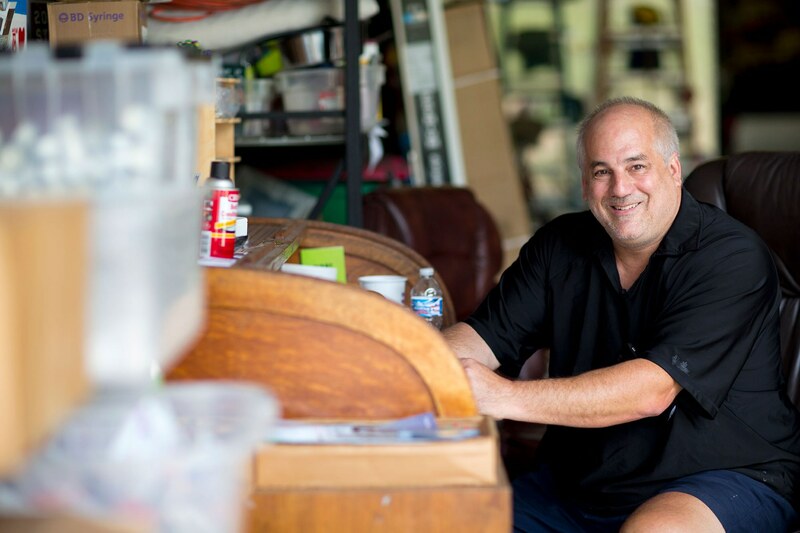 Dan Bigg, a founder and Director of the Chicago Recovery Alliance. Dan Bigg is in his office for the day, a converted warehouse on Chicago's West Side surrounded by vacant lots. Later he'll turn one of the silver vans parked behind him into a roving healthcare clinic, making stops in parts of the Chicago area suffering from a growing epidemic of opioid overdoses. He answers his cell phone. It's a North Side mother, Terry, cold-calling Bigg to say she just saw her son come back from the dead. Terry says she found her 27-year-old son lying on the floor of his room, stiff, unresponsive and turning blue. Luckily she had a vial of the overdose medication naloxone. She tried to inject him three times, finally hitting the mark with her last dose. Naloxone, the drug that bought Terry's son enough time to seek treatment, works instantly to reverse the effects of an opiate overdose. Bigg says through his organization, the Chicago Recovery Alliance, he has given out thousands of doses of the medication, which is also known by its former brand name, Narcan. Drug users and concerned family members like Terry come to Bigg's mobile clinics, his West Side warehouse, or similar outposts on the South and North Sides, to pick up free overdose prevention kits—brown plastic bags containing three clean syringes and three shots of naloxone. When they pick up at the Chicago Recovery Alliance, users sign in with a unique but anonymous code. Among other things, they tell Bigg how many bags of heroin they use each day, if they've overdosed since he last saw them, and if they've used naloxone to save anyone. In the 18 years since CRA has taken this bottom-up approach of distributing naloxone, Bigg says the organization has received more than 6,000 reports of users bringing someone back from a potentially deadly overdose. To stem the spread of bloodborne diseases like viral hepatitis and HIV, CRA helps intravenous drug users dispose of old syringes and exchange them for new ones. But Bigg and his team dole out more than needles and naloxone. They provide referrals to substance abuse treatment and medical practitioners, hepatitis testing and vaccines, secondhand clothes, instructional DVDs on how to use naloxone, medical advice—and compassion. CRA practices “harm reduction,” with the goal of facilitating “any positive change” for their participants, however each defines it for him or herself. That approach has drawn criticism from some who say it enables drug use, even encourages abuse with a steady supply of fresh needles. Asked about that, Bigg holds up one of his syringes. He learned about naloxone from Bigg, and recalls a time he used it to resuscitate an overdosing friend just down the street from CRA. Recently out of jail, Eddie's friend was especially susceptible because his tolerance had fallen in prison. He overdosed, and Eddie injected him. When he was back, Eddie taught him about naloxone. Eddie says he and his friend always keeps a vial around. Even as abuse rates for many drugs are falling, heroin use among first-time users has increased by nearly 60 percent in the last decade, from about 90,000 to 156,000 new users a year, according to the U.S. Substance Abuse and Mental Health Services Administration. Painkillers account for much of that, but a surge in heroin use has accompanied the growing epidemic of non-medical prescription opiate abuse. One reason for that may be simple economics: a bag of heroin goes for a fraction of what prescription pills cost. Many new users are middle-class, suburban and white—not the stereotype many have long associated with heroin addiction. In 2011, overdose became the number one accidental killer of adults in the U.S., overtaking auto accidents. Needle exchange programs are explicitly legal in 16 states. Illinois' programs operate under research exemptions within the Hypodermic and Paraphernalia laws. But twenty-eight states have removed or lowered legal barriers to syringe distribution. That shift accompanies new data about the spread of HIV. According to the Journal of the American Medical Association, HIV incidence among individuals exposed through intravenous drug use has decreased approximately 80 percent in the U.S. since the 1990s. Bigg wants the government to allow private physicians to prescribe methadone to treat addiction. "We have to quit handcuffing our physicians with the competence to utilize methadone to treat addiction in their office-based practices,” says Bigg. He also points to heroin substitution programs in Europe, where addicts can buy and use quality-controlled heroin or opiate substitutes in the presence of medical professionals instead of buying it in the streets. Such programs are proven to be effective, he says, yet remain illegal in the U.S. But needle exchange programs are a powerful start, he says, in part because they send the message that health care professionals and the state are working together with drug users, “through respectful collaboration,” instead of against them. Working with the AIDS Foundation of Chicago and other harm reduction programs in Illinois, CRA helped pass a law in 2010 that protects prescribers of naloxone and lay persons who use it to revive someone, as Terry did with her son. Since then use of the medicine has proliferated around the state. CRA has provided 38,500 overdose prevention encounters with drug user, with an untold number more reached through word of mouth. This year in rural southern Indiana, state health officials connected an unprecedented surge in HIV diagnoses with the powerful, expensive painkiller Opana, which people had been injecting in groups for a quick high. Many were found to have reused syringes so many times that they had worn off all the needles' markings. The situation grabbed national headlines, and under mounting pressure from the public Gov. Mike Pence temporarily suspended state law—as well as his own anti-drug policies—to institute a harm reduction program, including needle exchange. Legislation in May expanded the syringe exchange program throughout affected counties across Indiana. Bigg says he remembers being overcome by a feeling of foreboding while driving to Austin, Indiana to help out with relief efforts there. He says it was like “driving into the belly of the beast,” back to a time when HIV/AIDS and overdoses claimed many of his friends' lives, including that of John Szyler, one of CRA's founders. But things are different now, he says. There is progress. The powers that be have spent decades alienating themselves from this group of people … [but] the situation is ripe for success if they only listened to the people, and the science,” says Bigg. Site by Calvert & Co.